Stone Head Ridge is a lovely log cabin built of locally-grown poplar, dovetail-notched logs. 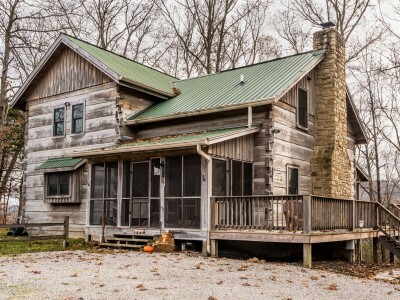 This cabin has everything you need to enjoy a little getaway time in Brown County, ensuring you a bit of well-deserved R & R. Park the car, and head to the front door with your bags and groceries, and you may soon decide to spend your entire visit right here. The large open-concept living room/dining room/kitchen is spacious, yet cozy for a group of 2 to 4 guests. Chilly autumn and winter days will be made lots more fun if you build a fire in the wood-burning stove, and snuggle in the comfy chairs or sofa. If you’re here when the weather is warm and sunny, then you’re going to love sitting out on the screened porch. You can access the porch from the main living area on the main floor, so open up the door and let the fresh air fun commence! Stainless steel appliances, a walk-in pantry, and plenty of counter space in the kitchen will encourage Stone Head Ridge guests to experiment with a new recipe or two, or simply make a batch of brownies for all to enjoy. There’s ample room to lay out the cook’s offerings… ample room to lay out offerings in the kitchen or at the dining table. Some folks have been known to use one table for meals, and the other for creative pursuits such as scrapbooking, sewing, making hand-tied fishing lures, or family game night. What will be your preference? Besides all this, you’ll find a powder room conveniently located near the kitchen, as well. When bedtime rolls around, it’ll be just a short climb up the stairs to jump into your jammies and crawl into bed. The master bedroom features a comfy queen bed, a dresser, and a TV. The second bedroom is outfitted with a king bed... great for the kiddos or another couple you may have invited to come along. No waiting for the shower though, as both bedrooms have their own private adjoining bathrooms. Don’t forget your swimsuits, because you’ll want to take a leisurely soak in the bubbling hot tub. Enjoying the views of the surrounding wooded hills as you’re relaxing in the hot tub is an indulgence everyone should allow themselves to have. Pass the evening gathered around the campfire pit and share stories of the glory days, as you roast the perfect hot dog or marshmallow. If you DO decide you can tear yourself away from this gorgeous property, you may want to visit The Story Inn for dinner, or hike some pretty trails in Brown County State Park. Horseback riding, mountain biking, ATV tours, paintball skirmishes, and fishing are all outdoor activities that you can enjoy while spending a few days in our area. Nashville has numerous restaurants, and plenty of shops to tempt you, too. Find your Brown County bliss by scheduling a stay at Stone Head Ridge log cabin!